Since 1 January 2018, settlement notices can no longer be deposited in the Queensland Titles Registry, with the previous settlement notice regime replaced by a priority notice regime. This article examines differences between the two regimes and highlights the practical operation of the provisions of the new Pt 7A of the Land Title Act 1994 (Qld) dealing with priority notices. Section 327 of the Criminal Code (Qld) creates an offence for the setting and placing of mantraps, spring guns and other devices. The archaic wording and oddly-specific subject matter seem, at first sight, out of place in a contemporary statement of the criminal law. This article explores the origins, elements and operation of this offence, and examines the contemporary relevance of s 327. 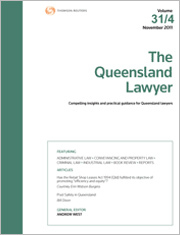 For the PDF version of the table of contents, click here: Qld Lawyer Vol 38 No 1 Contents.